Apartment TKO is an intimate 947 square foot residential project located in a Hong Kong High-Rise built in 2004. The project is designed to house a young newlywed and their newborn child at least for a few years. The existing flat consisted of 5 Bedrooms and 2.5 Baths. However, due to the lifestyle expectations of the world-travelled clients, the number of existing rooms left very little in terms of space and flexibility of use. After a series of discussions it was agreed by all parties that the flat decrease the number of rooms to 2 and bathrooms to 1, thereby increasing the amount of usable space for the homeowners. One of the previous bedrooms- the maid's room, was deleted to make way for a more spacious open kitchen and powder room. The colour scheme of the home was derived from the couple's own trip to Morocco, where they sourced a hand-made lustrous green mosaic floor tile made of regional clay. 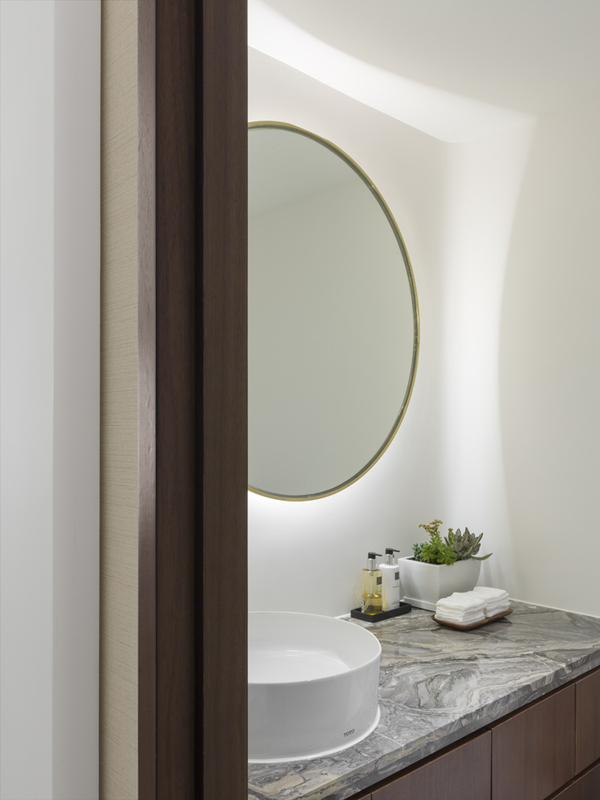 The green and beige colour of the tiles was the impetus for the material selection which consisted of chevron oak planking, camel coloured walls, fabric textured wallpaper, natural walnut, brass, and white finishes in three tones. A special terrazzo stone with muti-coloured aggregates on a white base was cut specially for the kitchen island. A hanging brass LED pendant light in an oval shape was designed by our studio and fabricated uniquely for this project. Commercial lighting fixtures were sourced from Viabizzuno, Vesoi RoanoakCo, and Resident Studio. Furnitures were sourced by client from BoConcept, Carl Hansen, Crate and Barrel and CB2. The two windsor chairs in walnut and antique brass and gold mirrors were designed by our studio uniquely bespoke for the client.